Cars 2 is opening today to less than stellar reviews (currently 37% on Rotten Tomatoes--OUCH! ), but even if the movie is a clunker (I'll post my review later this weekend), it will do little to tarnish Pixar's image as a haven of cutting edge animation and, well, a really cool place to work. 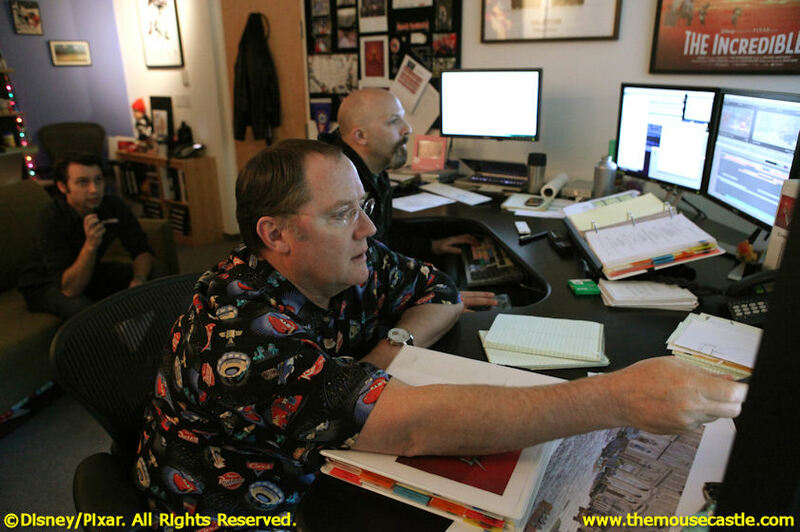 Below is a photo essay chronicling a day in the life of Pixar's chief creative officer and Cars 2 director John Lasseter. 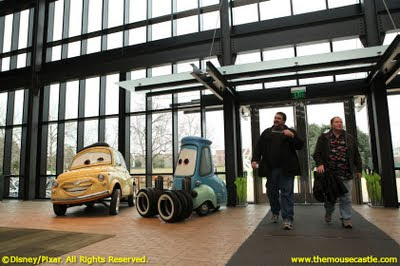 As much as I would have liked to follow Mr. Lasseter around all day and take pictures (now there's something to put on my bucket list), all the words and images are from Walt Disney Studios public relations and photographer Deborah Coleman. 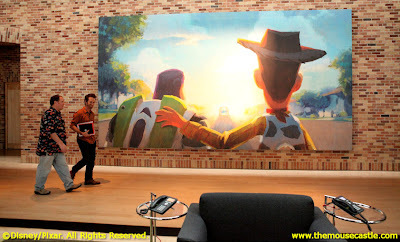 It's pure studio fluff, but anytime you can get a glimpse behind closed doors at Pixar, it's a good thing. Enjoy. 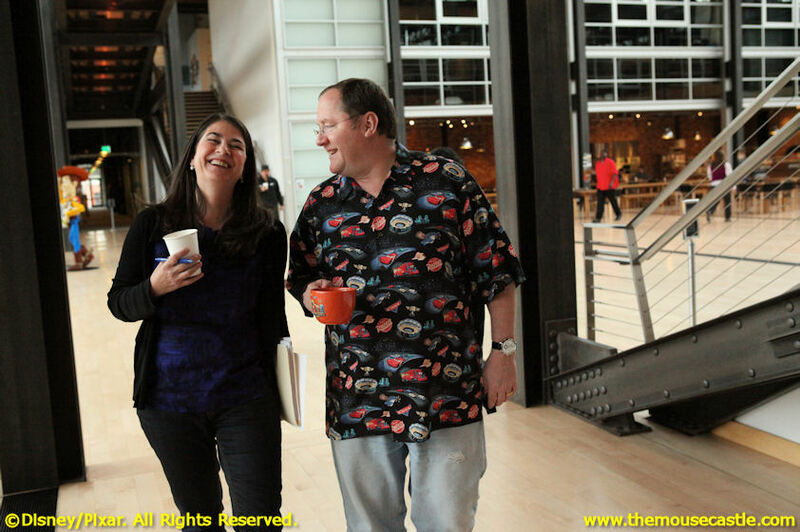 A SWEET START (7:48 a.m.) -- Kissing wife Nancy goodbye, "Cars 2" director John Lasseter hits the road for the 60-minute ride from his Sonoma County home to Pixar Animation Studios in Emeryville, Calif.
A WORKING COMMUTE (8:13 a.m.) – Lasseter rides instead of driving to work, allowing precious minutes to review "Cars 2" materials on an iPad. 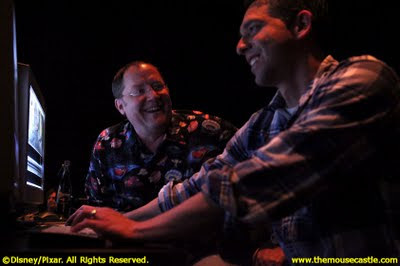 Supervising technical director Apurva Shah created a special application for Lasseter that allows the director to record notes verbally and email his feedback to the appropriate department. A GRAND ENTRANCE (8:52 a.m.) – Lasseter chats with fellow Pixarian A.J. 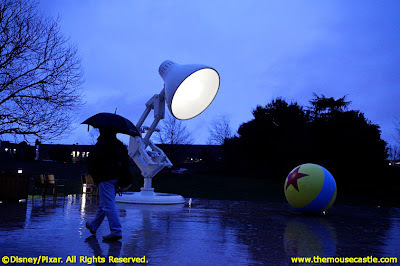 Riebli, a Sonoma County neighbor, upon arrival at Pixar Animation Studios. WHAT’S THE SCOOP? 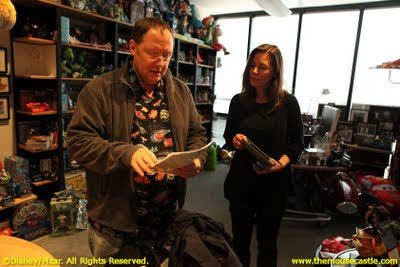 (9:38 a.m.) – Executive manager Heather Feng downloads Lasseter on the day ahead in his office. 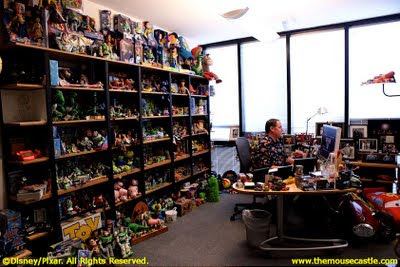 BEHIND THE DESK (9:43 a.m.) – With hundreds of "Toy Story" toys looking on, Lasseter reviews a "Cars 2" trailer on his office computer. 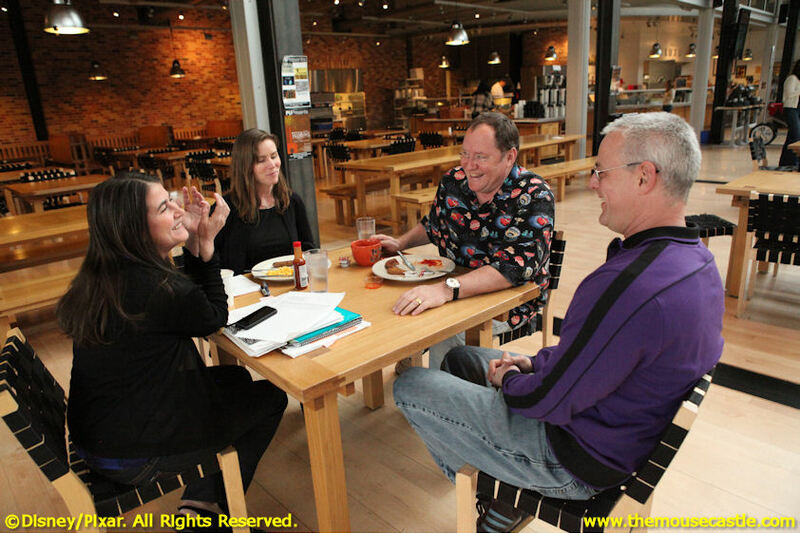 BREAKFAST WITH A SIDE OF “CARS 2” (10:09 a.m.) – Jim Murphy, director of creative artists, stops to chat while "Cars 2" producer Denise Ream and assistant Heather Feng review materials—and breakfast—with Lasseter at Pixar’s Luxo Café. IN UNIFORM (10:27 a.m.) – Producer Denise Ream joins Lasseter en route to a meeting. The "Cars 2" director dons his daily uniform, a Hawaiian shirt themed to his current project (this one features "Cars" characters). 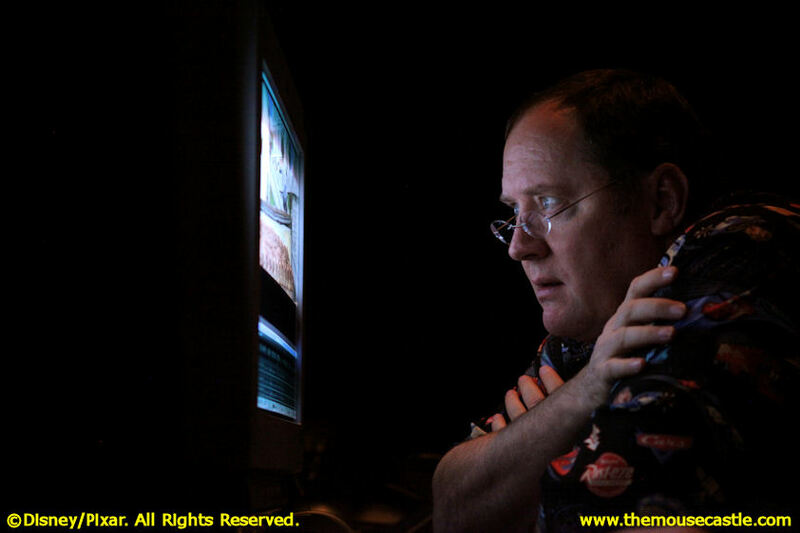 Lasseter currently has 350 Hawaiian shirts in rotation. BECOMING A TOY (10:47 a.m.) – Lasseter discusses product details of the John Lassetire toy car with Jay Shuster, character art director; Ben Butcher, manager of art, consumer products; Andy Dreyfus, marketing creative director; and producer Denise Ream. 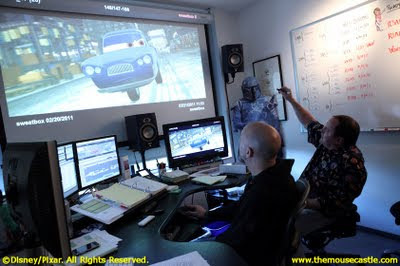 The character, John Lassetire, makes a brief appearance in "Cars 2" as World Grand Prix contender Jeff Gorvette’s pit crew chief. 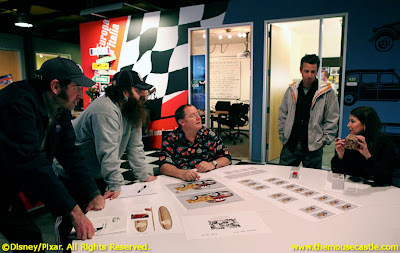 PAYING ATTENTION TO DETAILS (11:14 a.m.) – Lasseter joins various teams, including animation and effects, in the East Screening room to review "Cars 2" shots during back-to-back meetings. 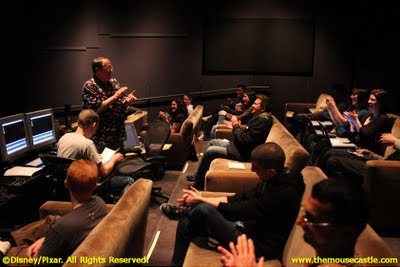 READY FOR HIS CLOSE-UP (11:50 a.m.) – Lasseter takes an up-close view of a shot in the East Screening room during back-to-back meetings. The director gives the team verbal notes, recorded by a production coordinator. LUNCH “BREAK” (12:50 p.m.) – Producer Denise Ream, production manager Jake Martin and executive manager Heather Feng join Lasseter for a bite to eat at Pixar’s Luxo Café. Though the group shares lunch every day, today’s topic of conversation is Pixar’s museum exhibit that is traveling the world. WE’RE WALKING (1:15 p.m.) – Lasseter walks with production manager Jake Martin to his next meeting, passing by a stunning and heartwarming piece of concept art from "Toy Story 3" that measures 11 feet by 22 feet. 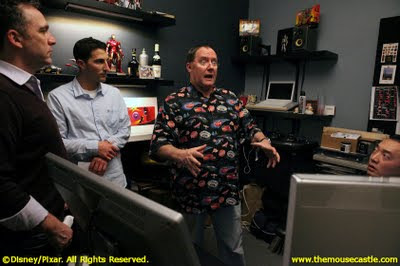 MAKIN’ THE ROUNDS (1:22 p.m.) – Lasseter begins a regular animation walk-through in animator Jean Claude Tran’s office, reviewing shots and giving notes like only he can. Animation coordinator Max Sachar and supervising animator Shawn Krause look on and record the feedback. NEXT! 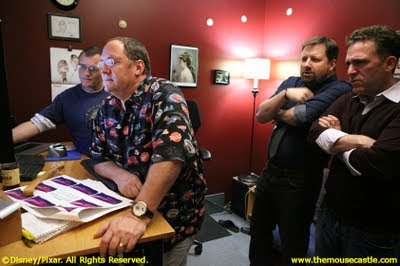 (2:04 p.m.) – Lasseter continues his animation walk-through in animator Tim Hittle’s office with supervising animators Dave Mullins and Shawn Krause looking on. PARTY! (2:43 p.m.) – Lasseter breaks from his duties to share a toast in the Pixar atrium with character art director Jay Shuster, celebrating his last day on the "Cars 2" production with several crew members. 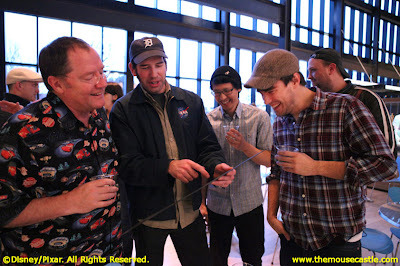 Shuster officially moves on to another film. THE RIGHT EFFECT (3:13 p.m.) – Lasseter touches base with "Cars 2" effects lead Gary Bruins in the East Screening room. Bruins and his team are behind the film’s more explosive moments. DETAILS, DETAILS (4:40 p.m.) – Lasseter joins film editor Stephen Shaffer in Shaffer’s edit bay office to tighten up select "Cars 2" sequences. 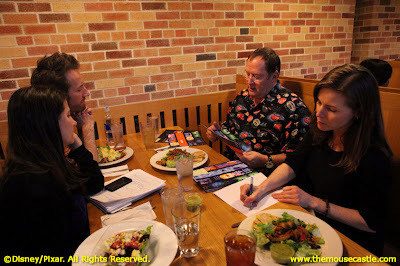 EDITORIAL REVIEW CONTINUES (5:03 p.m.) – Lasseter’s editorial review with film editor Steve Schaffer and animator Michal Makarewicz continues late into the afternoon. MORE THAN A MOVIE (5:26 p.m.) – As director and chief creative officer of Pixar and Walt Disney Animation Studios, Lasseter’s role includes approving items like poster designs and consumer products. Assistant Michelle Moretta walks him through the day’s materials. NIGHT LIGHT (5:57 p.m.) – Lasseter makes his way to his car at the end of a busy day, passing by two of Pixar’s most recognizable icons—the lamp and the red, yellow and blue ball that pay homage to the studio’s pioneering and Oscar®-nominated short, "Luxo, Jr." (1986). The ball later bounced around 1995’s "Toy Story," and has made appearances in several of Pixar’s feature films through the years, including "Monsters, Inc." and "Up." EVERY MINUTE COUNTS (6:04 p.m.) – Though Lasseter makes an effort to head for home by 6 p.m. each evening, the director does spend his commute reviewing shots from the film on his iPad. He should hit home by 7 p.m.—a home that is wired directly to Pixar with his own telephone extension, but the director tries to leave his work in the office (and car). It was announced this week that Lasseter will be among the well known names to receive stars on the Hollywood Walk of Fame in 2012. Congratulations, John, on a well-deserved honor. Wow, this looks MUCH different than the typical job! No wonder Pixar movies are so creative! Thanks for the great post!